England coach Andy Flower believes the IPL experience of his top-order batsmen will serve them well when the World Twenty20 begins in West Indies at the end of the month. Five of the squad - Kevin Pietersen, Paul Collingwood, Eoin Morgan, Michael Lumb and Ravi Bopara - have been plying their trade in India with mixed results ahead of England's attempt to finally win a global one-day tournament. Pietersen, despite being dropped for a period by Bangalore Royal Challengers, has been in impressive form while Collingwood has continued his productive year, but Flower thinks the main beneficiary of the IPL will be Lumb who could make his international debut when England play West Indies on May 3. He is the one uncapped player in the 15-man squad and is being earmarked to open the batting alongside Craig Kieswetter who made his debut in the one-day series against Bangladesh. "I think the experience of the IPL will stand these guys in very good stead," Flower said. "Michael Lumb will certainly benefit from the fact he was out there exposed to crowds of 30-40-50,000 people and a lot of noise and excitement. When he makes his debut for England it won't be as much of a shock or surprise as it might have been. "Ravi Bopara started the IPL well and it's a pity he didn't play the whole tournament but, again, exposure to international cricketers and some of the talk and conversation that would happen when you're in the dressing-room watching the game or when you're having a meal together in the hotel, will all be invaluable. And KP coming into some dominant form is a great thing for English cricket." Ironically the England player who joined the IPL with the most hype was Morgan following his impressive form in Bangladesh and against Pakistan in Dubai. 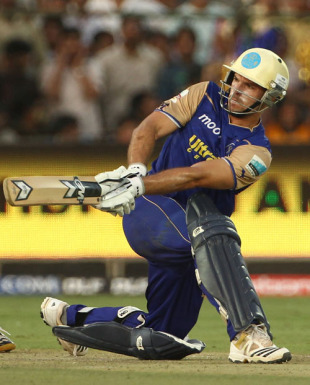 However, he only played six matches games for Bangalore, making 35 runs in four innings, before being benched as the likes of Pietersen and Cameron White arrived from their international duties. Flower, though, remains incredibly excited by the talent Morgan has shown in his short England career which included a match-winning, unbeaten 110 in the second ODI against Bangladesh to go alongside a 51-ball 67 against Pakistan in the first Twenty20 in February. "He's an extraordinary cricketer in many ways - he's not a big bloke but he hits the ball incredibly hard and he times it beautifully," said Flower, who was promoting the Sky Sports coach education programme. "He can play a variety of roles - he can play the man who hits it out of the ground, but he's also played a couple of innings for us where he's knocked it around and played quite a solid role in the middle order. "One of his qualities is the ability to adapt and to play the situation accordingly, and I think that is part of the difference between an international cricketer and an ordinary cricketer," Flower added. "I wouldn't want to pigeon-hole him too much. He might become a Test cricketer for all we know." England depart for Barbados on Sunday having feared for a while that they would face an arduous journey over land and sea to Dubai to catch a charter flight after the air chaos brought by the volcanic ash cloud.